Hi Ka-Tropa! Enjoy sending unlimited text messages to your family, friends and loved ones for 30 days with Talk N Text UNLITXT2ALL300 30-Days Unlimited Text Promo. 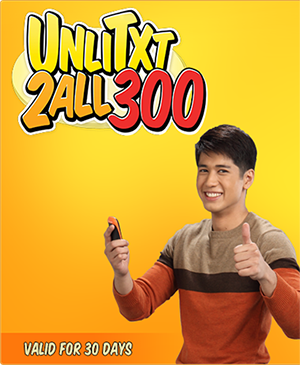 You can now enjoy unlimited text to ALL networks for 30 days for only Php 300. Here’s the quick instructions on how to avail this TNT’s 30-Days Unlimited Text Promo. If want to learn more about Talk N Text unlimited text promos, you can visit www.talkntext.com.ph or Talk ‘N Text Communications Facebook page for more details and latest updates.